well, not really 'odd', more like 'unclassified' ! Transcript of Isle of Wight section of Sadler's 1784 Hampshire directory. 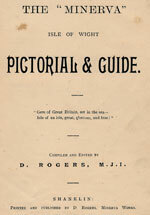 Transcript of Isle of Wight section of Pigot's 1828 Hampshire directory. If you have any old photographs or postcards of the Isle of Wight in bygone years, or Hovercraft, send a copy to me (preferable as a .jpg file by e-mail - 150dpi, files less than 500kbyte preferred) and I'll try to include them (with due acknowledgement).